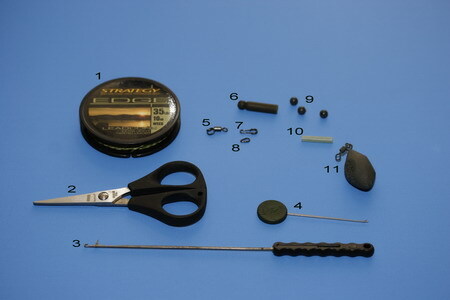 From the picture you can see all of the materials and tools that are required to make this rig. Some of them are optional but this is how I make it so I thought I would leave them in but mention along the way when they can be left out depending on your preferences. Please note that all of the rig components can be swapped around with other manufacturer’s parts depending on your locale but I would strongly suggest that you use the best quality bits you can find. Remember that the attitude “it’s good enough” is never enough and will cost you fish. 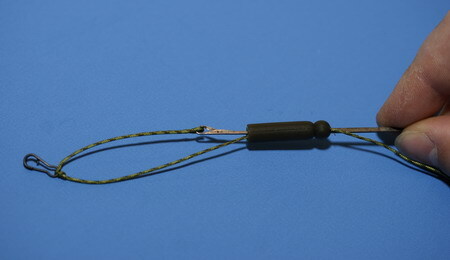 splice or knot to the main line. 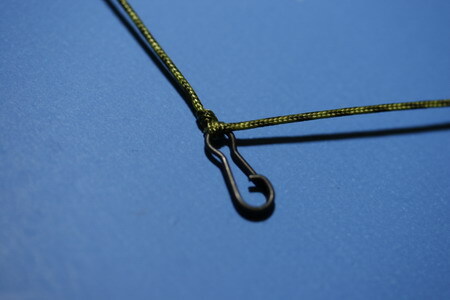 kind of knot to link the lead core to your mainline, this loop is not required. 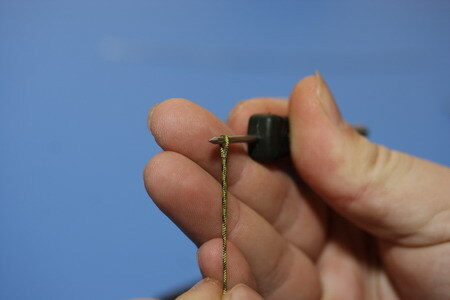 At the other end of the lead core remove about 15-18 cm of the core and splice a smallish loop. The loop needs to be about 3mm in diameter. 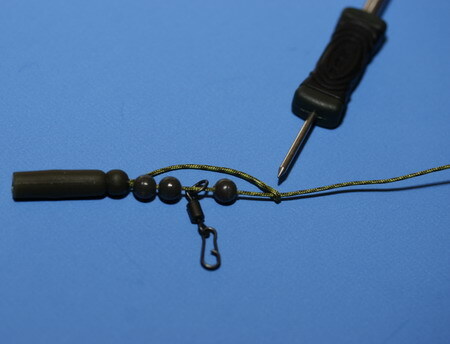 The small loop should be large enough to comfortably slide over the leadcore and loop knot / needle knot but not big enough to allow one of the beads ( item 9) to pass through. The reason we remove so much of the inner core is so that we can tie a knot in it and leadcore with lead in it is really hard to tie knots in. Taking your quick link, tie it with a 3 turn half blood knot so that the top of the knot sits against the inner lead core. 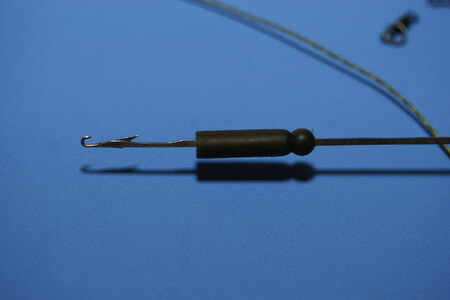 The free “tag” (the short end of the lead core that has the inner lead removed as per point 4) now has the small spliced loop at the end of it. A 3 turn half blood knot should be perfectly fine as we are using 35lb braid. 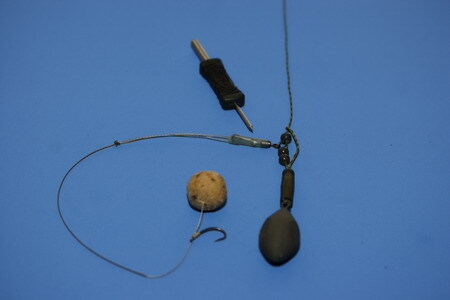 Take your closed gate baiting needle and put the helicopter bead on it and thread it on to the lead core. 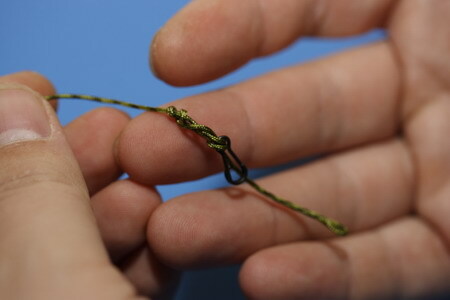 Once the helicopter bead is almost at the end of the lead core, thread the closed gate needle through the bead again and bring the tag of the half blood knot through the bead as well. Put on 2 beads, the ring swivel and another bead. Make sure that the top bead has a bore sufficient to pass over the lead core with out effort. 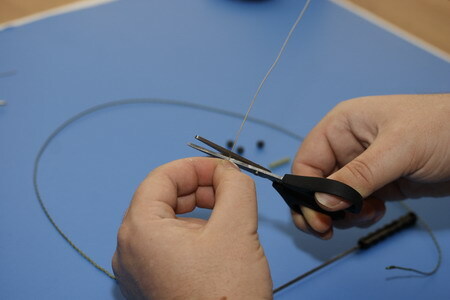 If it does not use a sharp knife to bore out the bead further until it will pass along the lead core and over your chosen method of connecting to the main line ( ie needle knot or loop to loop). Once this is done pass the loop on the tag end over the main section of lead core and pull tight. I also find it handy to add a quick change link to the ring swivel at this stage as well. Note that the loop on the tag end of the half blood knot is over the main lead core link. Add a hook link and you are done. I find that a small piece of rubber tubing is superb at stopping tangles and making sure that the hook link does not move out of the quick change swivel. If you use component 8 (a tear drop link) you get extra security on the quick change link. 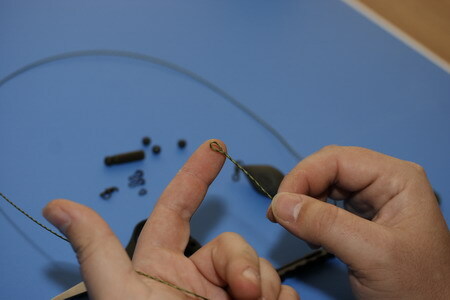 As you can see this method of constructing a helicopter rig, if completed as indicated should produce a very safe rig capable of detaching the hook link from the lead core / lead if the line snaps at any time. 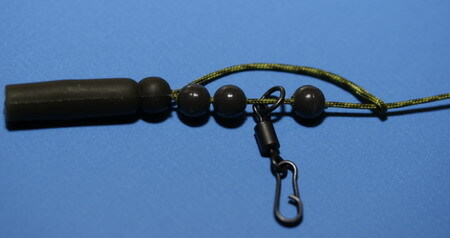 For more info on this and other rigs please see the FOX guide to rigs available from Amazon ( and others ) at this link. Please note I am in no way affiliated with FOX or Amazon. How this can carry the name ‘the best way to make a leadcore helicopter rig’ is beyhond me. Ridiculous. Why use it when the real helicopter rigs is much more tangle free. I cant see any benefit whatsoever by using this rig over a ‘real’ helicopter rig. Seems like someone had to much time on their hands after a few beers and knocked something up. Tell me a benefit over a real heli rig, please. Crap rig, really, its a mess. Hi Steve, well that is you opinion and i have no problems in letting people state their opinions. However my opinion is that it is not at all a bad rig. I would think of it less as a helecopter rig ( as the rig can not spin freely) but more of an alternative to a lead clip. You are right in stating that it wont rotate and if you want this then you will be looking at a real CV safety rig which can be found here http://www.masterblanker.com/2010/05/16/the-original-cv-safety-rig/, this rig is however safe someting that can not be said for others. Regarding your comment about tangles, the proof as they say is in the eating, and this rig has been used by myself over many years and I have not had it tangle once. Why dont you try it and report back ? Next Next post: Guest Blogger !